With less than a year to go before 2018, several U.S. House seats from Texas are drawing interest from potential contenders. WASHINGTON — The 2018 midterms may seem like a long ways off, but the national parties — and a growing list of potential contenders — are quietly mulling and preparing for campaigns for a slew of Texas-based House seats. Democrats are feeling some momentum in the state, thanks to Hillary Clinton's strong performance in its large urban areas in the fall. The national party has high hopes to take back the U.S. House. If that happens, they will have to improve their record in Texas. Meanwhile, Republicans are bracing for contentious primaries as the years-long civil war between hard-line conservatives and more moderate Republicans shows no signs of waning. At least one Texas chairman is already on the Tea Party's target list. And there will be at least two races for open House seats, as two incumbents — Republican Sam Johnson of Richardson and Democrat Beto O'Rourke of El Paso — have already announced they won't be running for re-election. Federal fundraising reports that were due on Saturday provide, in parts, a telling snapshot of which incumbents are bracing for a re-election fight and those who are perhaps not. But the 2018 landscape still remains very much in flux. Watch for other recruits to jump in after the state's legislative session concludes this summer. And history suggests some might wait until just before the December filing deadline to mount a sneak attack on an incumbent. Two other big unknowns: Will a court force Texas to redraw its congressional map ahead of 2018? And will U.S. Rep. Joaquin Castro launch a bid against U.S. Sen. Ted Cruz or cede the Democratic nomination to O'Rourke? The race to replace Johnson has seen few developments since he announced his plans to retire in January. The conventional wisdom now is the same as then — that this is state Sen. Van Taylor's race to lose. Taylor, a Plano Republican, has not officially announced his candidacy and is unlikely to do so until after the state legislative session is over. Collin County Judge Keith Self, who had previously said he was considering a campaign for the seat, told the Tribune on Monday that he has ruled out a run. While open-seat U.S. House races tend to attract crowded fields, much of the area's ambition is instead being channeled into the state Senate seat that Taylor is expected to vacate. Texas was a rare bright spot on the electoral map for Clinton in 2016, thanks to her outperforming historical Democratic turnout in urban areas like in Culberson's west Houston seat. National Democrats are making noise about this race, albeit cautiously. To play here, it will have to be a full-throated spending effort. The Houston media market is one of the most expensive in the state. National Democrats are interested in Houston attorney Collin Cox and Alex Triantaphyllis, the director of Immigration and Economic Opportunity at Neighborhood Centers Inc., a Houston nonprofit, as possible recruits. Conservative groups have also hinted at a possible primary challenge to Culberson. The Club for Growth just announced it was launching a TV ad in his district urging him to oppose a border adjustment tax. Culberson only posted about $132,000 in cash on hand for the first quarter. But he serves on the House Appropriations Committee — a magnet for donors. He is no stranger to challenges and can turn on the fundraising when under the gun, and colleagues were quick to rally behind him financially when he faced a 2016 primary challenge. Brady, the House Ways and Means chairman, narrowly escaped a 2016 primary runoff. And his Houston exurban district has one of the most organized Tea Party apparatuses in the state. As a result, he has a target on his back from conservative circles. Though no names of potential challengers have emerged yet, Brady is taking the threat of one seriously. He raised over a million dollars in the first quarter and has over $2 million in cash on hand. His campaign spending shows an incumbent who is carefully preparing his war chest with a stable of state-based consultants. This race has mostly been in a holding pattern since O'Rourke announced he was forgoing a re-election bid to challenge U.S. Sen. Ted Cruz. El Paso County Judge Veronica Escobar, a Democrat, is at the center of local and Washington speculation but is taking her time deciding on making a run official. Other contenders are watching her movements, and they may soon get impatient. Other frequently mentioned names include state Rep. Cesar Blanco, who is well-regarded in Washington from his days as a staffer in the U.S. House to Democrat Pete Gallego. He is also mentioned as a potential Democratic recruit for the 23rd District. Hurd is aiming for a third term in the only Texas district both sides will agree is competitive. Not since former U.S. Rep. Henry Bonilla lost re-election in 2006 has an incumbent been able to hold onto this seat for more than two terms in this swing southwest Texas seat. Democrats are anxious that Hurd, who reported a strong first-quarter haul of $500,000, is becoming entrenched in the district. He also outperformed his party's presidential nominee last fall, in a year when most Democrats expected Donald Trump to pull him under. The key here, in the Democratic worldview, is whether the 23rd District's lines are redrawn amid ongoing redistricting litigation. Should new lines make this district easier for Democrats, look for a competitive primary. Hurd's rival from the past two cycles, Democratic former U.S. Rep. Pete Gallego, told the Tribune he would consider running for the seat again under new lines. "If there's a new map, then there's a new race," Gallego said. Other Democrats are likely to give the seat a serious look, including Blanco, the El Paso-based state representative. But national Democrats are also looking into an up-and-comer in San Antonio: Assistant U.S. Attorney Jay Hulings. A former Capitol Hill staffer on the House Permanent Select Committee on Intelligence, Hulings is a member of the Castro twins' Harvard Law School class. This is the general election race most reliant on external factors. Former state Rep. Solomon Ortiz Jr. told the Tribune he is considering a Democratic run for this Corpus Christi-based seat — but on the condition that the district's lines change amid ongoing redistricting litigation. Farenthold begins the cycle in a weak political position — he has about $50,000 in cash on hand — and has had a series of political missteps over his four terms in the U.S. House, including a sexual harassment lawsuit that was later dismissed after an out-of-court agreement between the congressman's office and the plaintiff. For now, though, the district's Republican makeup should inoculate him from a competitive general election. But if the map changes, watch for Ortiz to jump in and run for the seat his father, former U.S. Rep. Solomon Ortiz Sr., once represented. "Absolutely, but I think we're still a long way from any final decision," the younger Ortiz said of the possibility of him challenging Farenthold. "Should the maps get altered, that's something I would consider." At 81, Johnson is the most frequently mentioned Texas member when it comes to speculation on possible retirements. Her low fundraising in the first quarter, just $1,000, only fuels that speculation. But there is a major hitch: As chatter increases that Democrats might have a shot at taking back the U.S. House in 2018, Johnson's seniority would position her as the one Texas Democrat likely to chair a committee, in her case, the Space, Science and Technology Committee currently led by another Texan, U.S. Rep. Lamar Smith of San Antonio. 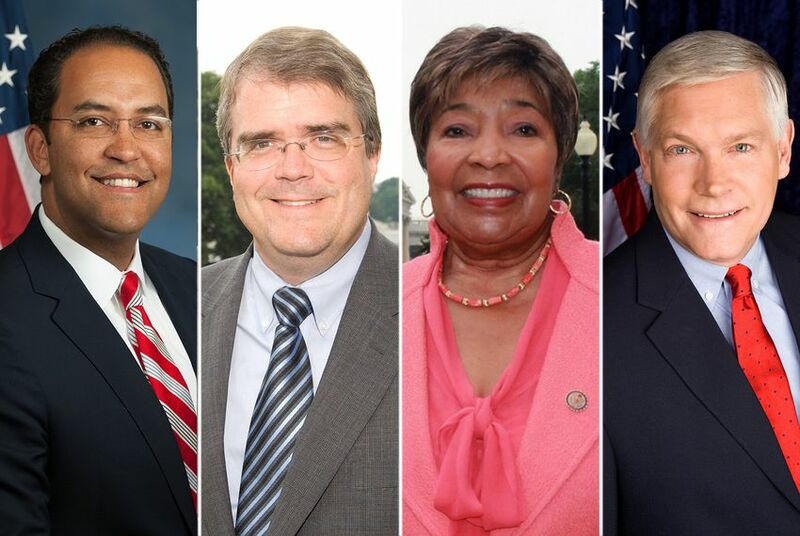 If she does opt for retirement, the two most frequently mentioned names in Texas and Washington Democratic circles to replace her are state Rep. Eric Johnson of Dallas and Jane Hamilton, chief of staff to U.S. Rep. Marc Veasey. Earlier this year, The Dallas Morning News added a slew of other names to the mix: state Sen. Royce West of Dallas, state Reps. Yvonne Davis of Dallas and Helen Giddings of DeSoto, former state Rep. Barbara Mallory Caraway of Dallas and former DeSoto Mayor Carl Sherman. If this race is competitive in the fall of 2018, it will suggest that Republicans are in serious trouble nationwide. Democrats are looking at Sessions' seat for the same reason there is interest in Culberson's: Hillary Clinton carried the district in 2016. The hope for Democrats, strategists say, is that they can lure voters who are socially liberal yet fiscally conservative, particularly white women, to their candidates both in Dallas and Houston. There is no shortage of Democrats considering a challenge to Sessions. Dallas school board member Miguel Solis, attorney and author Regina Montoya, former NFL player Colin Allred and former Hillary Clinton staffer Ed Meier are frequently named as possible recruits. But taking on Sessions is no small chore. Besides the challenges of campaigning in the expensive Dallas media market, Sessions is a committee chairman who formerly ran the National Republican Congressional Committee. As he's shown in recent years fending off primary challenges, he will likely have no shortage of money, and his political instincts are sharper than the average Texas congressman. A recent private meeting of some of the Democratic Party's most well-known Texas figures suggests party leaders see glimmers of hope for the midterm elections thanks to President Donald Trump. To beat Ted Cruz, Beto O'Rourke plans to throw out the Democratic playbook. Correction: An earlier version of this story incorrectly described attorney and author Regina Montoya's profession. Patrick Svitek and Jim Malewitz contributed to this report.